Pierogi are classic Polish dumplings stuffed with a variety of fillings. The most common fillings for savory pierogi include quark cheese with potatoes and onions, minced meat, and sauerkraut with mushrooms. The sweet version of pierogi is usually made with sweet cheese, bilberries, or strawberries. The most common toppings for pierogi are fried onions for the savory version, sour cream with sugar for the sweet version, and melted butter with bread crumbs for both. These are the most popular fillings and toppings in Poland, but you can really make pierogi with anything you want. I’ll try to give you some more ideas in my future posts. Today’s recipe is with sauerkraut and mushrooms as it’s the version traditionally eaten on Christmas supper in Poland. In my family, it’s always my grandmother who prepares Christmas pierogi. She makes them amazingly thin and light with lots of filling and serves them with delicious melted butter and breadcrumbs. No one else can make as delicious pierogi as she does. The recipe makes about 80 pierogi, which is, of course, long to make, but it is really worthwhile making them in large quantities as they can be stored frozen without lost of quality. It takes only a few minutes to cook frozen pierogi so they’ll be perfect for a quick lunch or dinner whenever you don’t have much time for cooking. 1. Place the mushroom in a large bowl. Pour warm water over the mushroom and soak overnight. Next day, place the mushrooms and water mixture in a large pot, simmer for about 10 min. Drain, keep the water. 2. Drain and rinse sauerkraut. Place in another pot, add the water you had used to soak the mushroom and cook until tender. Drain and leave to cool. 3. In a medium pan, melt the butter over medium heat. Add onions. Cook for about 2 minutes, until softened. Do not let the onions turn brown. 4. Squeeze the liquid from the mushrooms. Mix the mushrooms, sauerkraut, onion and butter mixture together and grind in meat mincer. If you don’t have meat mince, chop the sauerkraut and the mushroom finely with a knife. 5. Season with salt and lots of black pepper. *You can prepare the filling in advance and keep it in the fridge up to 2 days. 2. Make a whole in the center and pour boiling water into the crater. 3. Stir the mixture together with a fork, gradually incorporating the flour into the whole. 4. Turn dough onto a lightly floured surface and knead until smooth and elastic. 5. Wrap the dough in plastic wrap or cover with a damp dishtowel and let it rest for at least half an hour at room temperature. 6. Take a workable portion of dough and roll out very thin on a floured surface. 8. Roll out each circle a little bit more (you can also stretch the dough with your fingers). 9. Spoon about 1,5 teaspoon of the filling into the center of each circle. 10. Fold each circle in half around filling to form a semicircle, and firmly press edges together with your fingers. The edges should be free of filling. 11. Transfer the pierogi to a lightly floured baking sheet. Cover with a dishtowel. 12. Continue to fill and form pierogi, until all the dough has been used. 13. Now you can cook your pierogi or freeze them for later use. 2. Gently place a few pierogi in boiling water (do not cook more than a few pierogi at a time). Boil, stirring occasionally with a wooden spoon to keep them from sticking to the bottom. 3. When the pierogi are floating on the surface let them cook 2 minutes more. Be careful to not to overcook them. 4. 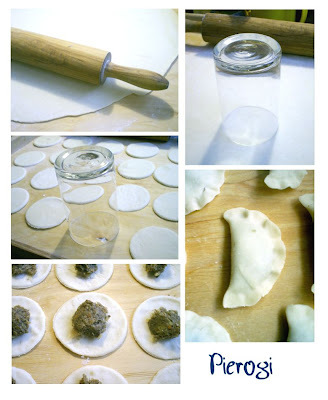 Remove ready pierogi with a slotted spun or skimmer. 5. Top with melted butter and bread crumbs mixture (see recipe below). Serve immediately. 1. Place your pierogi on a lightly floured cookie sheet, make sure the pierogi are not touching each other. 2. Place the dish in the freezer. 3. When the pierogi start to freeze and are not sticky anymore, you can transfer them to plastic bags. 1. Place the bread crumbs into a pan. Cook on a low heat stirring from time to time until the crumbs turn brown. Be careful to not to burn them. 2. Add the butter and heat until the butter is bubbling. This will take a couple of minutes. 3. Pour the bread crumbs and butter over the pierogi. Serve. Witam! Odkrywam twoj blog i z przyjemnoscia bede tu zagladac! Ach te pierogi! Czekaja na mnie w zamrazalniku juz zrobione... Twoje sa bardzo apetyczne i pewnie bardzo smaczne! 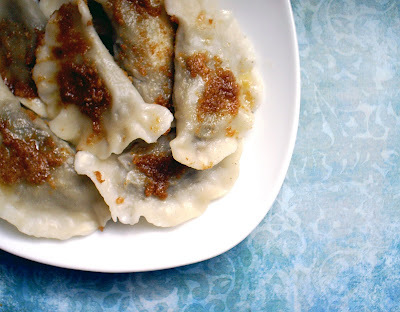 Have just discovered your blog and was excited to find your pierogi recipe. I am Polish/American ... don't speak Polish ... and pierogis are food of the gods. I make them with separate mushroom or sauerkraut fillings but will try this combining the two. Can't wait. hello, I just finished making this recipe, and from what I can see it turned out great! The only problem is, that I think I've already messed it up! I didn't read very carefully, and I boiled ALL the pierogies, and then I froze them. I was planning on making these for Christmas dinner, are they already ruined beyond hope, or is there a way to save them? Please let me know, if you can, I realize this is an older post. I hope it's not ruined! Anyway, thanks for the great recipe, I am Polish and a couple other things, but my Polish grandmother loves pierogies!! Don't worry, your pierogi will be fine. I always freeze mine uncooked, but I know some people cook their pierogi before freezing. When you want to serve them, just cook them again (frozen) in a pot of boiling water as you did before. This is an extremely nice recipe ^^ Thanks a lot, my British colleague at work asked me to find her a nice recipe for Pierogi as she used to live in Canada for couple of years and she met many Polish people there, also had a chance to try Pierogi and fell in love with them. This one will be perfect since I don't have to translate it from Polish :) Thank you so much! Thank you for posting this recipe. My mom makes these every Christmas but I never paid attention to the method, haha, and since I can't reach her soon enough I'm glad I found the recipe on your site. And you're right, our "elders" make the best dough. It really needs to be thin to bring out the flavor of the filling. Anyway, thanks again!